"In this world, there's no such thing as the perfect crime!" Last week, on the recommendation of our guide in the world of shin honkaku, Ho-Ling, I decided to take one last crack at the Kindaichi franchise with a recent animated series, Kindaichi Shounen no Jikenbo R (The File of Young Kindaichi R), which was originally aired in Japan between 2014 and 2016. The third time proved to be the charm! I watched a two-part episode, The Blood Pool Hall Murder, which revolved around a very tricky murder committed during an annual Go tournament between two rivaling school teams. 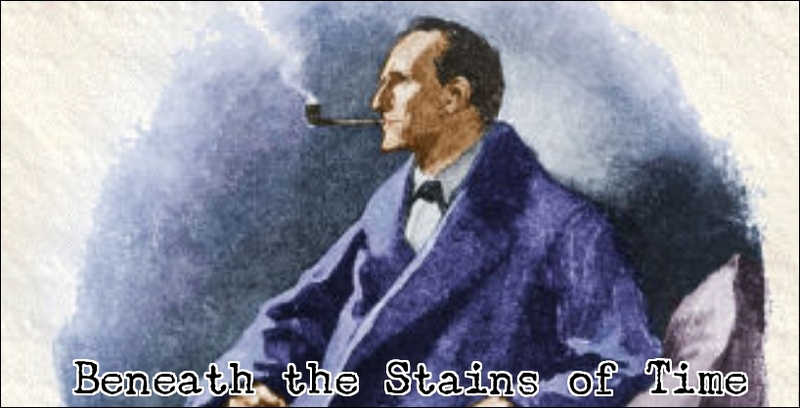 A short, clever and pleasantly put together detective story that made excellent use of its background and even had some Go-themed sleight-of-hand – such as the killer's alibi-trick and the victim's dying message. So I wanted to try a longer, multiple episode story next and one of them was recommended to me twice. The Prison Prep School Murder Case consists of five twenty-minute episodes and offers an intricate, multi-layered plot with one hell of an alibi-trick. A trick that turns a string of gruesome murders into a large-scale impossible crime! So let's dig in, shall we? 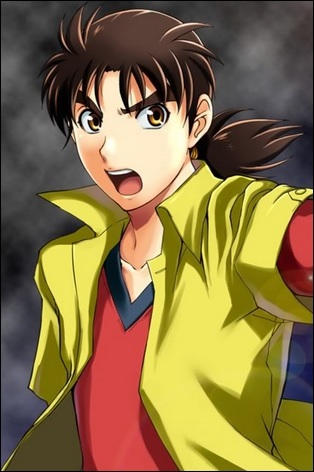 As noted in my brief introduction of The Blood Pool Hall Murder, the protagonist of the series, Hajime Kindaichi, has an astonishing IQ of 180, but has earned himself a name as a lazy underachiever and his grades have finally caught up with his reputation – placing him in danger of having to repeat a year. Luckily, his long-time friend, Nanase Miyuki, knows of a good prep school and generously offers to come along on a cram course. There is, however, one problem: the prep school in question resembles and operates like prison. Gokumon Prep School is a study retreat, known among its students as "Hell's Gate," where the first body is discovered as soon as Kindaichi and Miyuke stepped inside the school building. One of the former students, Moroi Ren, who revisited the school to do a test is fatally poisoned in the counseling room and pressed the alarm bell in his death struggle. The poison was introduced with several needle pricks to his hand and the local police assumes the murder is a random act done by another student, who cracked under the pressure, but Kindaichi believes the murderer had singled out Moroi as a target and knows it was done – a trick known as "Magician's Select." Regardless, this doesn't bring them any closer to the person responsible for the poisoning and only established that something dark is bubbling beneath the surface of Gokumon Prep School. During the final half of the opening episode, Kindaichi and Miyuke bump into two of their policemen friends, Police-Inspector Kenmochi and Superintendent Akechi. The former has been in charge of the school poisoning case, while the latter confirms Kindaichi suspicions that his old nemesis has a hand in the murder. A magician and criminal genius, known as the Puppeteer from Hell, who made his first on-stage appearance in The Magical Express, but eluded capture after being revealed by Kindaichi. Now he "manipulates people like puppets" and "writes perfect criminal scenarios for people who bear grudges." So the young detective has quite a challenge ahead of him! 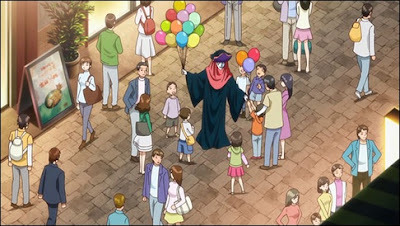 The next episode moves the large cast of characters, including Kindaichi and Miyuke, to the secondary buildings of the school, called Moonlight and Sunlight, which are situated in a dark, sprawling forest with an hour's walking distance between them – something that becomes relevant when the impossible alibi-trick comes into play. But more on that presently. Kindaichi and Miyuke are split up and assigned to two different groups. A science-and a humanities-oriented group, but this is also the point in the plot where the school demonstrates it's deserving of its nickname and reputation. The students are stripped of their personal belongings and clothes, which are replaced with prison-style jumpsuits. Some students with poor grades can even be locked up in solitary confinement to help them completely focus on their studies. So you can say that the administration of Gokumon Prep went out of their way to conform to the nightmarish image we have in the West of juku (cram schools). Anyway, the harsh, closely watched environment does provide safety to the students from the unknown murderer and even Akechi is present in the (undercover) role of instructor, but students still manage to go missing from the premise. One after another, students from both groups began to disappear after walking out of a full classroom. One was ordered to fetch a fresh piece of chalk from the hall closet, while another finished a test and was excused. The viewer is aware that they were murdered, but the bodies are nowhere to be found and everyone simply assumes they wandered into the woods – after cracking under all of the pressure. Something that's apparently not all that uncommon at Gokumon. All of this takes up two-and-a-half episodes and this was, perhaps, too slow, but the pace picks up when all of the bodies, one after another, turn up in thematic fashion that alluded to the material they had been studying. So that was an interesting and unexpected twist in the plot. However, what really saved the episode is the unfurling of the complicated and involved explanation for the apparent impossibilities surrounding the murders over the next two episodes. Initially, I feared my review of The Prison Prep School Murder Case was going to be lukewarm, because I erroneously thought I had figured out the who, why and how of the case, but it turned out my explanation had only touched upon the most elementary parts of the solution. And was completely wrong about the ingenious alibi-trick. In my first review about this series, I mentioned a blog-post by The Reader is Warned, "But is it a Locked Room Mystery? The case of the impossible alibi," on which I commented what kind of alibi qualifies as an impossible problem and the episodes that make up this case tick all of the boxes – since every potential suspect were together, in the same room, when the murders happened. So none of them appeared to be, physically, capable of being the killer. I really thought I had stumbled to the truth, early on in the story, when one of the episodes showed a birds-eye view of the grounds surrounding both buildings. It's what gave me an idea how murder could be committed in each building while everyone was alibied. But my solution was childishly simple compared to what was revealed. Sure, you can argue that the magnificent alibi-trick is too complex and involved, but my only real complaint about it is that the entire story was obviously written around this idea. The trick came first and the story second, which explains the shoddy pacing in the first two episodes and the extreme rules of the prison-like prep school. As the strength of the whole story hinges on the trick, the writer had not much to work with in the setup of the story and the tight regime was needed to make the plot work. However, if you want pure, undiluted ingenuity, you will appreciate the overall plot of The Prison Prep School Murder Case. Arguably, it's one of the better examples of how an elaborate alibi can turn a detective story into a full-bloom locked room mystery. I really wish I could tell more about the nature of the trick, but that would be spoiling the surprise and that's a capital offense around these parts. Finally, I need to point out that, at times, the story tried too hard to touch a dramatic note, but regularly failed at it. And the final, over-the-top showdown with Hell's Puppeteer was preposterous! With his hell-fire magic, flower darts and high-school drama-class dialogue. Nevertheless, I did chuckle when the Puppeteer told Kindaichi he wanted to meet him again "on the stage of another atrocity." Oh, no, I thought, does that mean Yozaburo Kanari is going to write their next case? Alright, alright! I promise that's the last swipe I'll take at Kanari in this series of reviews, I swear! did you catch the blatant dichotomy in the school's concept? a teacher locks up a student in solitary. in the next scene, another teacher says "it's hard to stimulate the frontal cortex when you're in the same room all day, so you'll move to a different room for each class". LOL! i also liked this mystery even if i found a lot of the kindaichi returns episodes mediocre or far-fetched. however it would have been amazing if you could have shared what YOUR explanation and theory was. i understand you wanted to keep the review spoiler-free. but we are in the comment section now, care to elaborate on your solution? I'll briefly go over my solution and put the text in reverse, because, even for the comments, it would be too spoilerish. You can re-reverse (decode) here. Copy and past the text there to read it in the correct order. Of course, the trick I imagined was mere child plays to what was actually pulled off, but I hope this quick rundown satisfied your curiosity, anon. As for your swipe at Kanari - actually, some of the earlier Kindaichi mysteries were good too. I have especially fond memories of 'The Headless Samurai Murders', which I thought was even better than 'The Wax Museum Murders' (which I believe you liked) and 'The Magical Express Mystery' (where the Puppeteer first appears). As I said in my review, the pacing of the story's opening is shoddy because the whole story appears to have been written around the trick. So the story doesn't really begin until the trick is set into motion. Everything before that is basically filler. But yes, the trick was definitely worth the slower opening. I love this kind of ingenuity. Anyway, I think I'll use one of the traditional locked room stories for my next stop in this series. The Alchemy Murder Case appears to have one. "I suspect the source material Kanari used for the locked room tricks were even better. ;)"
Glad you liked. This story　was easily the best of the 2004~2011 series (it was an annual series back then). The basic idea of the trick can be traced to a certain Japanese mystery novel, but it's definitely not a bare-bones copy, but a meaningful, and original variation on the concept. With all the maps and movements going on, I also think this is a good example of making use of the visual medium in a different way from just 'drawing a clue in the background'. There's also a live-action feature length adaptation of this story, which was pretty okay (it laid the foundation for the recent TV drama series). The setting of the prep school was moved to Malaysia though, as it was an international production, featuring actors from various Asian countries besides the core Japanese cast. Was this your first time watching the anime? I'm a big fan of Wada's orchestral music for this series. As for a small bit of trivia: voice actor Kappei YAMAGUCHI originally played Hajime in the first animated feature in 1996, which was later followed by the original TV series (1997-2000). It ran in an one-hour block together with Detective Conan, but Yamaguchi was *also* Shinichi in Detective Conan, and the producer didn't want him to play both leads in the same block, so the current voice actor was chosen (who does a great job by the way). They got the original voice cast together again for the R series, even though there was a 14 year gap. Yes, this is the first time watching any of the Kindaichi anime series. You know well my reading of the original manga went. So I never bothered with any of the TV-series. "The basic idea of the trick can be traced to a certain Japanese mystery novel, but it's definitely not a bare-bones copy, but a meaningful, and original variation on the concept." Now that I think about, Amagi used another variation on this idea for the central trick of The Kamikakushi Village Murders, didn't he? I can see why. It's a great idea. And I do hope the novel you alluded to will one day be translated into English, because would love to take a look at the story in which this trick originated. I'll probably take a look at The Alchemy Murder Case next. So you can probably expect a review of that four-part episode sometime next week. Tsk, TomCat, do retract a claw or two - just because one of Canary's works ostensibly resembled a famous one doesn't entail that the rest of his works bear similar traces of inspiration... :D Certainly I don't recall Ho-Ling mentioning any possible source materials for 'Headless Samurai Murders'. Oh, it's not just that Kanari wrote an abridged copy-paste of Soji Shimada's The Tokyo Zodiac Murders or an incredible pale imitation of Gaston Leroux's The Mystery of the Yellow Room. Oh no. It's also that he a pretty poor mystery writer in his own right, which shows when he takes a whack at constructing a plot (lightly) armed with only his own ideas. Graveyard Isle is a perfect example of this. I simply can't imagine that the bad, poorly handled and transparent plot was lifted from an existing detective novel. Seriously, you should re-read that volume and note how poorly he handled the identity of one of the murderer. A character who, at one point, acted noticeably out of the character to help create one of the poorest and simplest impossible crimes in the entire series. What I'm trying to say here is that I don't have a very high opinion of Kanari.